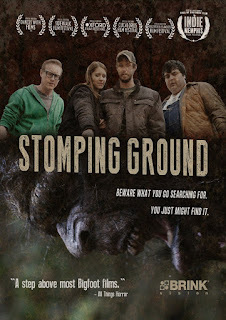 Stomping Ground is about a young couple, Ben and Annie, who go on a weekend trip to Annie's hometown in North Carolina. After meeting one of Annie's old friends, the couple get more than they bargained for when they agree to an impromptu Bigfoot hunt that turns their weekend trip into a living nightmare that threatens their lives. I was impressed with the writing and use of character that was used to bring about the Bigfoot aspect of the story. City boy Ben is clearly a fish out of water in the South, thankfully not in an over the top way that makes him look foolish, but rather just awkwardly out of place. When he brings up a Bigfoot article posted in the men's room while at a bar with Annie's old “friend” Paul, it comes across as a simple attempt to fit in. The whole set up is sudden and spontaneous yet believable and conversational. Stomping Ground is character driven as we see relationships form through different regional personalities and ways of life in an authentic way that doesn't rely on blatant stereotypes. The humor also comes out of these observations which makes the comedy in the film a natural result from this clash of cultures. John Bobek as Ben is good at playing the hesitant, try to avoid confrontation city guy while Jeramy Blackford as Paul is good at the blunt, doesn't hold back country boy and their relationship makes for strong conflict and high stakes for Ben and Annie's relationship. It also creates tension regarding the Bigfoot hunt: are the strange little happenings really something in the woods or is Paul playing a joke on Ben? The pacing of Stomping Ground gets a bit slow throughout the films second act as the focus centers on the conflict in Ben and Annie's relationship with random moments that hint at something is in the woods following the group. While it never becomes boring, I can see some viewers becoming restless through the long stretches of conversation and walking through the woods. The strength of any Bigfoot movie hinges on the appearance of the creature with fears that it simply looks like a man in hairy suit. Stomping Ground does it's best with a low budget to avoid this and I'd say it was successful. While the Bigfoot does have a man like appearance, the practical effect look of the Bigfoot is effective with a lot of detail put into the face making for great shots of the couple close ups we get of the monster. I can just imagine the CG mess that a big budget film would have turned in and I appreciated the effort here. It's unfortunate that Stomping Ground drops the ball in the final act. The last 20 minutes of the film seem like a different production detached from the previous hour. The editing seems rushed, the dialogue weak and nonsensical in the given situation, and the acting for some reason comes off as almost comedic in some parts. I'm not sure what happened after such a well written script leading up to this point, but it was a disappointing and anticlimactic finale to say the least. 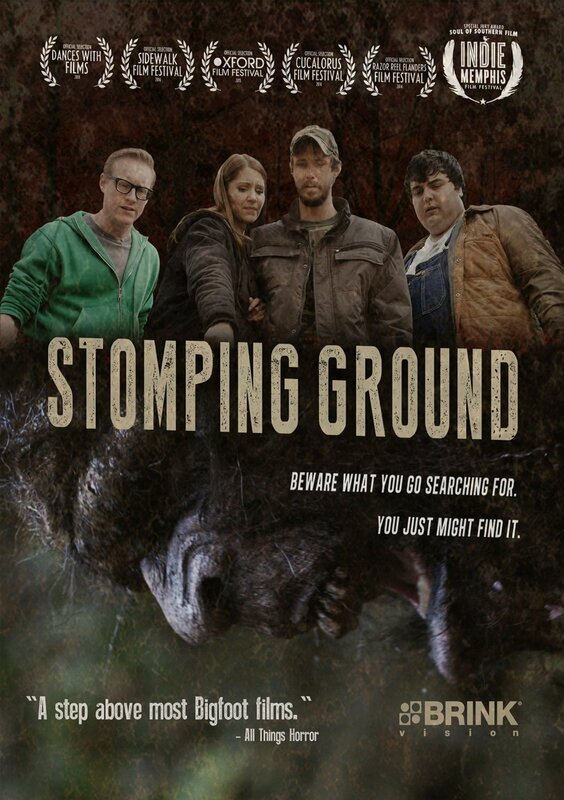 Stomping Ground is mostly a very solid film with strong characters and an interesting, well executed premise with influences from Deliverance, The Evil Dead, and Friday the 13th. It's unfortunate that the final act almost completely undoes the notable effort the film puts forth until that point. It's worth a watch if it ever comes to Netflix, but I wouldn't go out of my way to see it.